All is not calm aboard the Millennium Falcon in this new teaser for Star Wars: The Last Jedi and honestly, it has us feeling a *bit* nervous. Yesterday, Star Wars dropped this new 15-second clip, reminding us we’re thankful for The Last Jedi’s December release. The teaser featured many of the moments we’ve come to anticipate from the trailers — Rey’s training, Luke reuniting with the Falcon, and Kylo Ren looking *especially* moody — as well as new footage of Captain Phasma ominously saying, “So good to have you back.” Something tells us that whoever she’s saying that to — presumably Finn — is in for some serious trouble. But Captain Phasma isn’t the only one who has us nervous in this new The Last Jedi teaser. An extended shot of one of the most talked about moments from the trailer hints at a potential enemy for Chewbacca. Chewbacca shows off his famous Wookiee roar in the first trailers for The Last Jedi and we were all *pretty* chuffed to see an adorable Porg try to emulate the roar with its own little squawk. That’s right, Chewie just straight up swats the little furry creature out of his sight. While we don’t know too much about the new guinea pig-looking creature other than the fact that Ahch-To, the site of the first Jedi temple, seems to be overrun with them, Porgs have taken over the Star Wars fandom. Maybe Chewie’s tired of the fandom’s obsession with new creatures? First R2-D2, then Ewoks, then BB-8 after a 30-year break, and now Porgs. 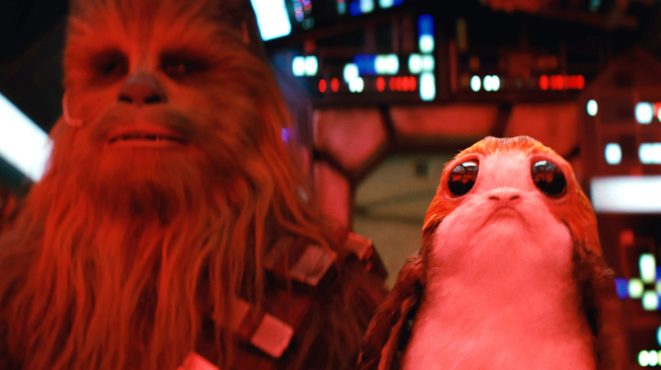 Guys, maybe Chewie just wants some love — or this Porg is annoying him in a *very* big way. We’ll finally see Chewie and the Porgs in action when The Last Jedi hits theaters on December 15th.